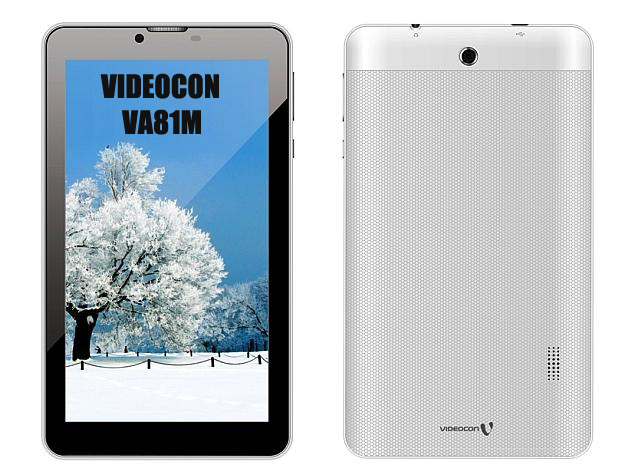 Videocon has launched its latest Dual sim voice calling tablet dubbed VA81M. It has been priced Rs.4900 and can be purchase from Flipkart. Videocon is not known player in tablet market and in this range top brands have already launched their tablets. Unique feature about this tab is that it is offering dual SIM support. Specification features Android Kitkat v4.4.2 OS out-of-the-box, powered by Cortex-A7 dual core processor clocked at 1.3 GHz and coupled with 512 MB of RAM. It packs 4 GB inbuilt storage which can be expanded via. microSD card upto 32 GB. Screen size is 7-inch supporting HD display with pixel resolution of 1024 * 600. Connectivity includes Wi-Fi, Bluetooth, Voice calling, Dual Sim, GPS and USB 2.0. It sports 2 MP rear camera with fixed led flash and 0.3 MP front camera. Battery is of 3000 mAh which is rated to deliver 9-hours of talk-time and 96-hours in standby mode. Tablet has preloaded Apps. Like:- V-Safe, V-secure Antivirus and Opera mini. Tablet weights 220 grams and measure 188.1 * 108.1 * 10.3 mm in dimension.